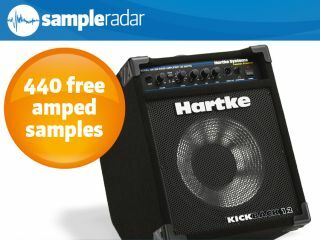 The drum samples were sent through a Hartke Kickback amp. We're all for producing music 'in the box', but when you want to add a bit of grit and character to your sounds, nothing beats sending them through a real amp. And that's exactly what's been done to the samples in this week's collection: it offers re-amped bass, drum and guitar loops in four different styles. The samples are split into four tempo-labelled construction kits: Dub, Jazz, Experimental and Funk. Each of these contains drum, bass and guitar loops. The amped samples are supplied in a zip file, so you'll need to extract them before you can see them. Enjoy!